I would like to take this opportunity to wish you all a Happy Christmas and a wonderful New Year. I am very proud of all the boys and the progress that they have all made so far this year. The school is buzzing with activities such as swimming, football, choir, spikeball, quiz, recorder and basketball. 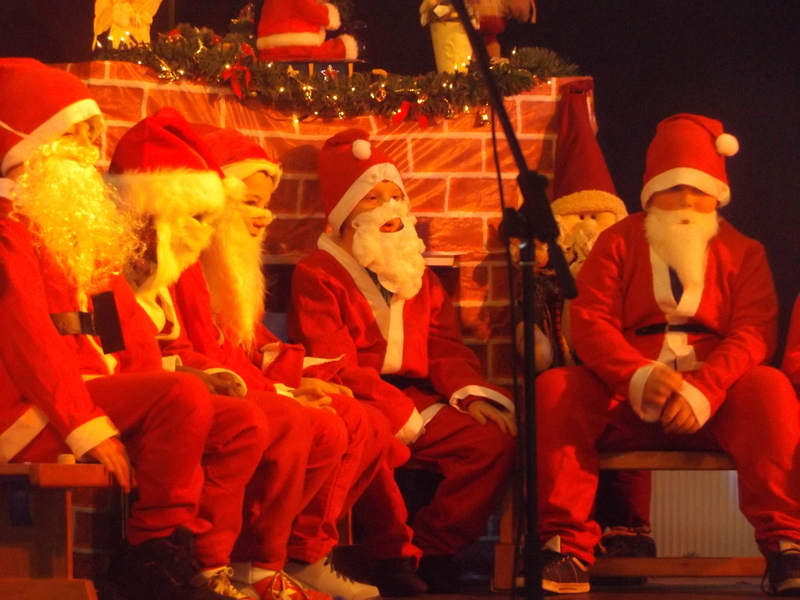 The school’s annual Christmas concert was very successful. There were many highlights on the night with the school choir and individual classes giving outstanding performances. Great musical talent and acting skills were displayed. Many thanks to all of those who worked on the production. We had a wonderful inaugural Christmas fair with a special visit from Santa, it’s certain to be an annual event. We have a wonderful staff and I want to take this opportunity to thank them for all they have done. Many thanks to the Board of Management and the Parents Association. Best wishes of the season for a safe and happy holiday. I hope that Santa is good to all parents and children! School was a hive of activity last week as preparations got underway for our Christmas fair. We had a lucky dip, face painting, raindeer food and a cake stall. Cards and decorations made by the pupils were for sale also. There were beautiful Christmas logs and we had a raffle. Santa also visited the school and there was great excitement! The Christmas spirit was in abundance in school on Friday. The first school term is coming to a close. We have been busy with events including assisting at the coffee morning to welcoming new parents of junior infant classes in Sept, our flag day and at Halloween had a great response to our mask competition. Our Christmas card lines sold well at the Post office and the Credit Union and we thank all those who bought or sold lines there. Each boy or family were also given a card to sell at home and we appreciate the response especially at a time of year when there are many financial demands on all of us. Our Christmas concert raffle went well and we had fun selling the tickets and choosing prizes. The visit by Santa organised by the parents association to all classes before the school breaks up on the last day is always a fun event and a chance for all of us to get into the Spirit of Christmas. We are lucky with our team of dedicated parents who participate in the parents association. All monies raised go to the school. We are always on the lookout for new members and would welcome others to join us and take a share in the activities we run throughout the year. Our monthly meetings are informal and last about an hour. Join us as we begin 2016 and help shape our association and our children’s future. Our next meeting is Tuesday 12th Jan 2016 at 8.00pm. We in the Parents association wish all the boys, their families and school staff a very happy and joyful Christmas. Preheat your oven to 170 and line a muffin tin. Then melt the chocolate, butter and milk, and leave to cool. Mix all your dry ingredients. Meanwhile beat your egg and add the sour cream. Mix your egg mixture and chocolate with the dry ingredients. Spoon the mixture into your bun cases and bake for 20 minutes until well risen. For the topping melt the chocolate and place in piping bag. Draw snowflake and wait to cool. Enjoy with tea! A big thank you to all the boys who put together lovely boxes for the Christmas Shoe Box appeal. What did the reindeer say when he saw the elf? In September we were delighted to accept our national flag and our 1916 Proclamation. 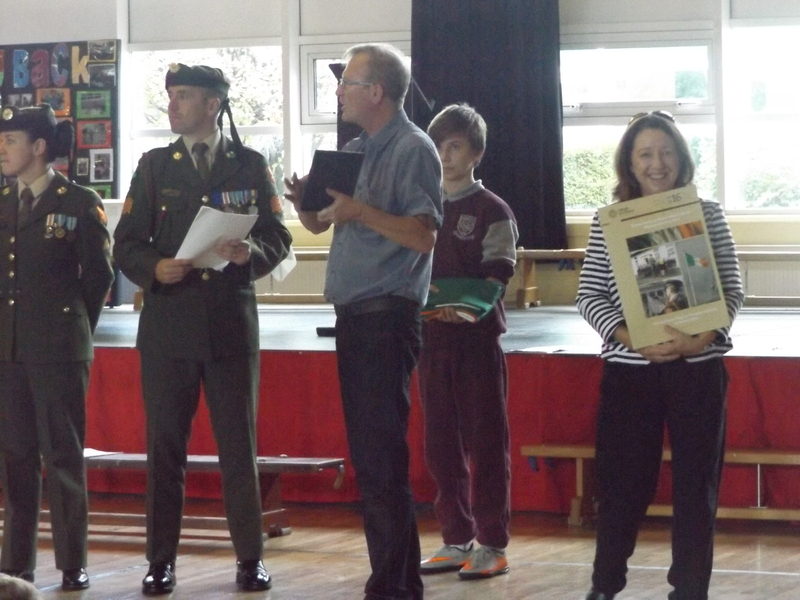 The official presentation of the flag was by members of the Defence Forces. The presentation included a history of the national flag and the correct protocol for its use. In October we celebrated National Maths Week with Maths Eyes, class activities, maths quizzes and many more fun activities. 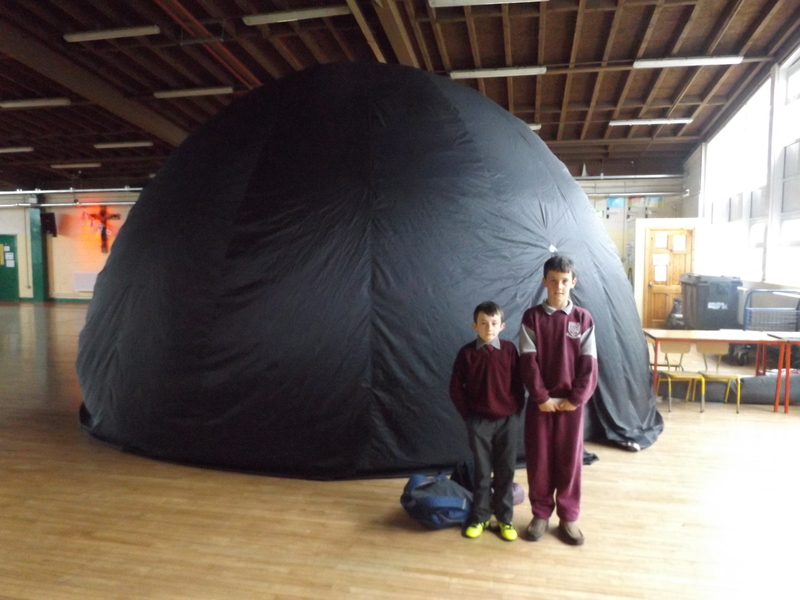 In October we interacted with planets, stars and galaxies in the Sky Dome when it visited our school. Pupils learned all about the planets of the Solar system, they saw the galaxy and the milky way, they watched the moon, planets and stars rise and cross the sky and set in seconds rather than hours, they saw the stars better than if you were in the darkest part of the Irish countryside with perfectly clear skies, they learned why some stars and constellations rise and set over Irish skies and others do not. We had a very interesting visit from organic farmer Vincent O’Sullivan. He gave excellent talks to all the classes on farming. The children were also shown how to churn butter and grind wheat into flour….so no need to buy butter over Christmas!! Pupils had a wonderful experience during science week especially classes that were lucky enough to attend Carlow IT to meet scientists, explore science labs and take part in experiment. Pupils also visited Carlow library. Junior Entrepreneur Beanie Geanie Hats- the coolest hats around!! We have been making Beanie Geanies for over a week now for our junior entrepreneur project. Here are some points on how we got started. We had a contest to decide which product we would use.There were lots of good products to choose from but the Beanie Geanies were the best. David Walsh the creator of Netwatch (a very successful security cctv company) came in to talk to us about how to get started. He gave us lots of good tips, he told us to start small or we could loose it all straight away. He told us all about how his company grew.We watched a video on last years junior entrepreneurs.We have been going to classes taking orders and had great sales at our Christmas fair. Pupils had a great day at the Inter Schools Cross Country Race in September. Every primary school in County Carlow was represented with hundreds of pupils participating. The boys had a great day with many featuring amongst the winners. Our most impressive result was in the fourth class section, where John Phiri came first in the county out of 100 runners. John then went on to represent Carlow in the All Ireland. Well done also to Shane O’Brien in sixth class who came 5th and to all the boys who ran, it was a great achievement. Our rules include….all play, equal time, lots of rallies, lots of hits, Lots of FUN. 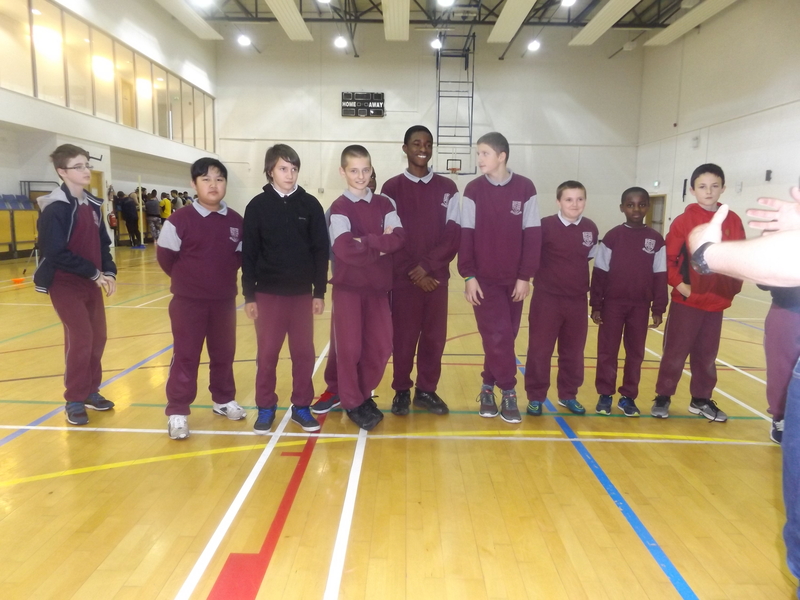 In December the boys from fourth class represented our school in an all day FAI Indoor Futsal Soccer It was a great day of fun in St. Fiacc’s hall. The children played loads of fantastic soccer, scored brilliant goals, won loads of matches and were so sporting. Well done everyone. Mr.Percy and Mr.Farrell. Gaelic football and hurling has been a great success with the junior classes and all boys have thoroughly enjoyed the training sessions. Basketball with Jim Connolly has started back with great numbers showing up to training. Spikeball is a new sport introduced to Askea Boys this year. Spikeball is an initiative developed by the Volleyball Association of Ireland to aid School Teachers in introducing Junior Volleyball to their students. Volleyball has traditionally been viewed as a difficult sport to introduce to young children, but it doesn’t have to be as we have learned in Askea. Pupils have taken it up so quickly and relish in the challenges and fun starting a new sports presents. Spikeball is an adapted 4-player v 4-player volleyball game that was introduced to Ireland in the last 3 years and has seen participation levels increase dramatically. Swimming and Gaelic Football with senior classes have been enjoyed by all. Junior infants: Pupils have started Aistear and have had great fun in Santa’s workshop. Pictures of our junior infants in September. Senior infants: Jones’ and Ms. Healy’s classes enjoyed being chefs with Ms. Tully and had great fun with their gaelic football training with coaches from Éire Óg. First class: Boys enjoyed making rice krispie buns in the parent’s room. Thank you to all the parents who helped. Lots of spooky masks were made for Halloween! Second class: Pupils enjoyed hurling training with Leo McGeough, gaelic football training with Éire Óg and cooking. Boys went to the library during science week to a talk about renewable energy, solar panels and wind farms. Third class: Pupils took part in swimming lessons and received their certificates. For science week pupils went to the IT Carlow to meet Dr. Death who taught them all about the history of medical science! They learned all about medicine in the Middle Ages. They learned that operations were done without anaesthetics, leeches and maggots were used to make people better. If people were bleeding they were given other people’s blood to heal them and doctors used to drink patients’ urine to see what was wrong with them! It was pretty gruesome! Fourth class: Pupils have been hard at work in the kitchen making buns, soup and apple crumble. Fourth class were selected for the school athletics team with John Phiri coming in first place out of all fourth class. Boys also participated in a futsal competition in Graiguecullen and came in second place. Benjamin Balcer scored ‘Goal of the tournament’ in the final. Marko Mujernik had his artwork displayed in the Constructing Safety handbook. Both classes were overjoyed at the amazing performance of Oliver by the Presentation College. Six boys competed in the Cumann na mBunscoil gaelic football. Pupils took part in Maths for Fun activities with Ms. Tully. Parents volunteered to help for six weeks which was a huge help. Pupils went to the library for a Horrible Histories talk in October. Pupils took part in the Shared Peace poster competition run by the Lions club. Pupils also made wonderful Christmas cards with Ms. Tully. Ms. Henihan’s boys completed projects on The Maya, The Himalyas and Leonardo Da Vinci. All projects were presented to Mrs. Kelly and teachers. Pupils loved questioning each other on their respective projects and using the microphone to present. Ms. Fitzpatrick’s boys made ancient castles as part of their weekly home project. Pupils also made Christmas decorations for the school Christmas Fair. Sixth class: Both sixth classes are taking part in the Junior Entrepreneur programme. Trevor from Childline came in to talk about Kilamanjaro as pupils raised money for him last year, the pupils saw many amazing pictures. Pupils visited Carlow IT during science week where they participated in many science experiments and got to experience what it would be like to study science at third level. Pupils created lighthouses using electric circuits and made wonderful World War 1 projects. Computer News: We have received a very generous donation of twelve top range refurbished computers. Over the coming weeks these will be set up in all the mainstream classes. Including project use they will also be used for Reading Eggs, an excellent literacy program. HSCL teacher Ms.Tully ran ‘Maths for Fun’ with Room 11. 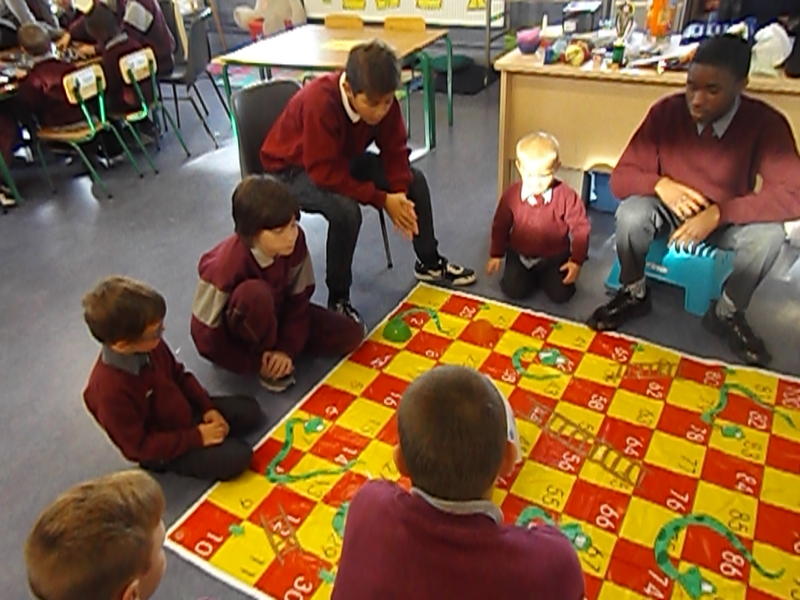 The class was spilt into smaller groups and each group played different maths games. Thank you to Ben and Sam’s mother Fiona and Brendan’s mother Aisling who helped out. HSCL teacher also ran ‘Maths Eyes’ with Room 11. ‘Maths Eyes’ is where we try to see the real life maths that is all around us. The class was spilt into smaller groups and each group took photos all around the school, where they could see maths. Try it at home. Thank you to the parents: Cillian and Michael’s mother Sarah who helped out. A reminder that the “Knitting/Craft Club” for parents runs every Thursday morning from 9.30am-1030am. Come along, even if you are at beginner level. All parents/guardians and grandparents are welcome. We have collected 1400 used batteries. Great work, keep it up! Proceeds of the battery collection will be donated to ‘LauraLynn –Ireland’s Children’s Hospice’. During this festive season please remember the 3 R’s: Recycle, Reuse or Reduce your rubbish as much as you can. Many thanks. Christmas decorations, present wrapping and cards add a touch of flair, colour and personality to the Christmas period. But experts estimate that paper waste over this time is equivalent to 5-12 million litres of biofuel – enough to power a bus to go to the moon 20 times. So why not recycle or make your own Christmas decorations? It’s a great excuse to have fun and keep kids busy. 5th class made beautiful decorations to sell at our school fair.